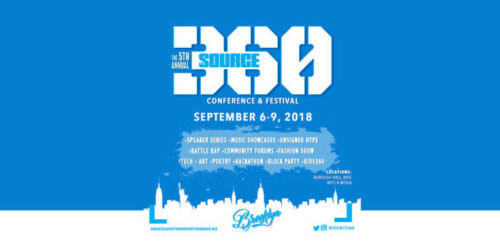 The Source Magazine Presents The 5th Annual SOURCE360 Conference & Festival! The 5th Annual Source360 Conference & Festival is a week away! The 3-day, cultural event brings together Hip Hop icons, new and emerging musical talent and industry activists to celebrate Hip Hop and promote civic engagement. This year, Source360 will honor the late, and great, Aretha Franklin with a Hip Hop and R&B Live Tribute. For 30 years, The Source Magazine has been the Bible for Hip Hop. For the past five years, Source360 has become more than a festival and hub for creatives. it’s eventually expanded and grown into a gathering of national entertainment and civic influencers, artists, and entrepreneurs ready to assess the state of Hip Hop, issues influencing the culture and providing a platform for the genre’s leaders and newcomers. Confirmed performers, speakers, and participants include: Brad “Scarface” Jordan, Doug E Fresh, DJ Kool Herc, Maino, Casanova 2X, Phresher, Freeway, Mysonne, DJ Self, Keke Wyatt, Elle Varner, Jacquae, and more. See below for schedule breakdown & link to tickets!